Valentine’s Day is just around the corner! If you want to make this year’s Valentine’s Day a day to remember, than download my booklet with delicious and romantic ideas – a guide full of smart, easy and cute ideas to wow your Valentine. 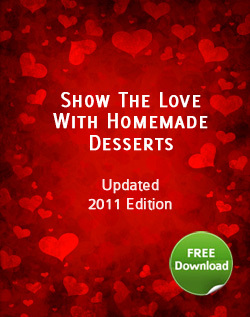 The recipes below are just a few examples from my completely updated digital booklet Show The Love With Homemade Desserts (2011 Edition). Is your sweetheart vegetarian or vegan? This rich chocolate dessert is 100% dairy-free – but even people who crave milk chocolate will appreciate its smooth texture. 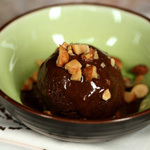 Low in fat, but high in cocoa powder, this bittersweet chocolate sorbet is for true chocolate lovers only. Spread it between two low-fat grahams to make it into an ice cream sandwich. When I was growing up, Valentine’s day wasn’t just about chocolate. Granny always made her own treats, handmade goodies that had nothing to do with candy. Breakfast and snack time can be tasty and healthy with these tender cupcakes made with oat flour. 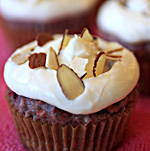 Oat contains lots of soluble fiber, which makes these soft, moist cupcakes delicious AND heart-healthy. My roommate in college, Christina, used to beg me to make Texas Sheet Cake. Granny used to make it for us on the Fourth of July but my healthier version is delish year-round! This moist buttermilk chocolate cake is ideal for any confirmed calorie watcher: It’s only 100 calories a slice. 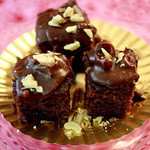 Want a sweet Valentine’s Day treat to pop in your kid’s lunch box? 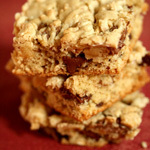 Try these chocolate chip cookie bars that are made with 100% whole-grain flour, a mixture of whole wheat and oats. They’ll be the envy of the lunch room, just remember to leave out the nuts if your school cafeteria has a nut-allergy policy.